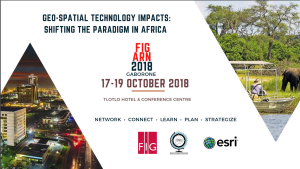 The theme of this years ARN workshop is: Geospatial Technology Impacts: Shifting the Paradigm in Africa" and will take place in Gaborone, Botswana 17-19 October. Young Surveyors organise a meeting on 16 October 2018. Jakoba Kgopolelo President of Botswana Institute of Geomatics invites African land professionals to the Africa Regional Network 2018, a prestigious event where Geospatial professionals across the continent of Africa will be gathered to discuss pertinent issues in their profession cutting across many industries. The event will be held in Gaborone, Botswana from the 17th to the 19th October 2018 at Tlotlo Hotel & Conference Centre. The theme for this year’s network is “Geospatial Technology Impacts: Shifting the Paradigm in Africa”. The Africa Regional Network focus is to build the capacity of African Surveying & Geomatics Associations and individual professionals to act as agents of positive change and encourage the process of development and growth for the benefit of Africa and its people.